Professor Ethan Mereish (left) with research coordinator David Hawthorne. of the importance of the event. 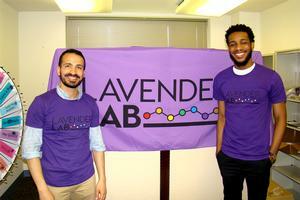 The Lavender Lab is a new research lab in the Department of Health Studies, College of Arts and Sciences at AU. The lab seeks to produce and disseminate knowledge to better understand and reduce sexual orientation, gender identity, and racial/ethnic disparities in health. More specifically, the Lavender Lab conducts research on the psychological and social determinants of health for LGBTQ individuals and racial/ethnic minorities. Given that members of stigmatized minority groups frequently experience unique stressors associated with their identity, including real or perceived discrimination, violence, and internalized stigma, the lab is particularly interested in minority individuals’ experiences with stigma and its effects on mental health including depression, anxiety, suicidality, and substance use. As director of the Lavender Lab, it is the goal of Ethan Mereish, assistant professor in the Department of Health Studies at American University, to conceptualize and examine these experiences to identify factors that may serve as protective or resilience promoting against stigma. A psychologist by training, Mereish joined AU as a tenure-track faculty member in 2015 after receiving his PhD in counseling psychology from Boston College, completing a clinical psychology residency at Harvard Medical School, and a postdoctoral research fellowship at Brown University. Mereish is currently a principal investigator of three NIH-funded studies examining the effects of stigma and on mental health and substance of LGBTQ youth and adults. Currently, the Lavender Lab is recruiting youth who identify as LGBTQ between the ages of 12 and 18 for the TRUTH Study. To better understand their experiences with stigma, resilience, and well-being, every day for 21 days, participants receive a link to a survey that asks about their experiences in the last 24 hours. Promoting the TRUTH study was the primary reason the Lavender Lab attended Leading with Pride. To attract youth to our resource table, we prepared a spinner prize wheel with popular LGBTQ “slang” associated with prizes. Our spinner wheel was a big success—youth and adults were eager to take a spin! As I meet to enroll LGBTQ youth for the TRUTH study, I’m continuing to find that LGBTQ youth are very interested in our research. Already at such a young age, they have stories to tell; they have voices and experiences that affect their mood and well-being, which inspire their resilience. They have been harassed, threatened, and invalidated because of their identity. They understand that research on LGBTQ youth health is sparse and they are eager to participate in research relevant to themselves and other members in the LGBTQ community. Recently, we’ve seen youth at the forefront of our nation’s most pressing issues. I see the TRUTH study as a continuation of that theme—utilizing the power and resonance of youth voices and experiences to understand and build upon LGBTQ health research. After the resource fair concluded, the youth workshops began. As I was leaving, I heard parts of an interactive icebreaker encouraging youth to get to know each other and chant positive affirmations. I felt encouraged by the love and support showcased at Leading with Pride. I also know that there is still more work to be done. Some recent research has shown an increase in hate crimes and violence against LGBTQ individuals. Mereish’s research is timely and reflects the amazing work being done in the department of health studies to improve health and reduce health disparities. Stay tuned for more work coming from the Lavender Lab! If you are an American University student who is interested in getting involved with the Lavender Lab, please contact Mereish at mereish@american.edu.